Jamila Multipurpose Wall Rack: Great Storage Solution for Any Room! Magazines, mugs, towels, scarves, or caps… whatever needs to be organized, the Jamila Wall Rack is up to the challenge! With its simplistic scroll design and plenty of hooks, this multipurpose wall rack complements any decor and will be useful in any room. This metal wall rack is available in two finishes: brown and white. Click here to view this fabulous wall rack! 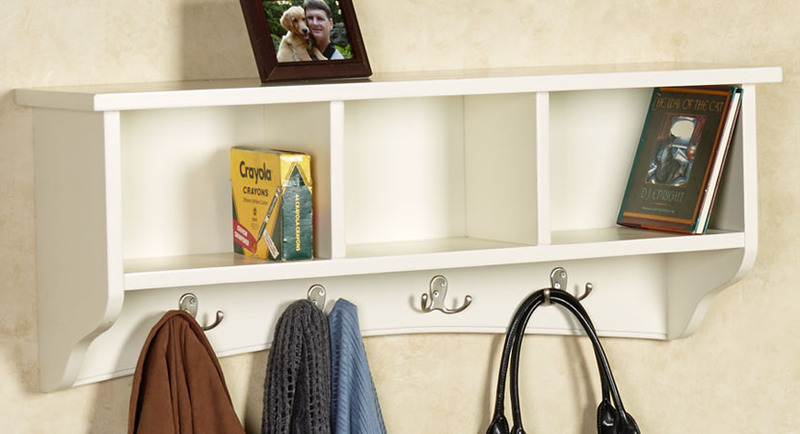 Leave a comment Jamila Multipurpose Wall Rack: Great Storage Solution for Any Room! Does your home’s entryway resemble a cluttered shanty by the sea instead of a tidy coastal cottage? Let us help with these decorating ideas! Shape your entryway into a cute, accessible coastal command center with a charming mix of decorative pieces and handy organizers. Click here to view all the items we used to create this look. Start with casual organizers and hooks in light or weathered hues for a beach-inspired aesthetic. The rattan drawers of the Corvaserro Storage Cabinet will hold stray articles and keep them out of sight. Hang your keys, wraps, or parasols from the Shoreline Treasures Wall Hooks, so that the items you need most are within easy reach. Step onto the skid-resistant Rest, Relax, Refresh Foam Comfort Mat to kick off or slip on your sandals. The fun lighthouse and starfish design wonderfully complements the coastal entryway theme. Guide the eye upward with functional wall pieces that resemble driftwood or boardwalk planks. The Relax on Beach Time Wall Clock is hand-assembled in the USA from local natural pallet wood and features cool hues. 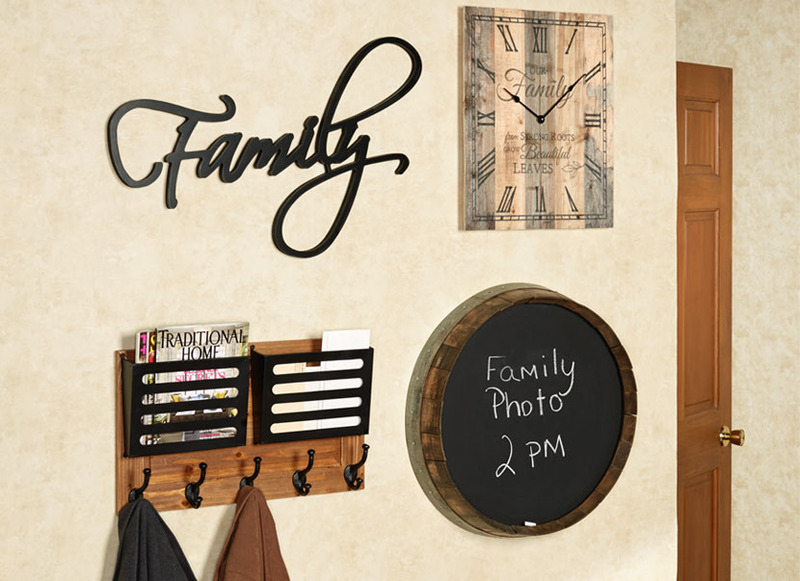 Leave messages to your family on the Weathered Chalkboard, and use the included clips to dangle notes or your favorite beach photos. Do you think of the entryway as being synonymous with clutter? With everyone traipsing in and out, it’s no wonder that this high-traffic area collects more than its fair share of shoes, scarves, coats, and purses. Stress not; these organizing and decorating ideas will provide you with plenty of inspiration to get the entryway in order. Begin with the essentials: functional, storage-friendly pieces that will keep mess at bay. Then let your decorative side flourish! Complement those practical storage bins and organizers with darling wall decor that will make your entryway feel stylish and inviting. Click here to view the items used in the entryway looks below, as well as other items you can use to create your own custom look. For the first entryway, we chose coordinating furnishings with clean, simple lines. Neutral colors like ivory provide a sense of lightness, while allowing for decorating versatility. We paired the Balinda Wall Storage Unit with the Dylissa Bench for a cohesive look and slightly staggered the furnishings. Bring comfort to this often-used space with an anti-fatigue mat, and don’t forget to place some storage bins nearby for shoes and accessories. At 60” long, the Heavenly Stripe Runner Mat provides substantial, skid-resistant coverage on your floor. The Finn Storage Basket Set will be a welcome addition with storage space for a variety of articles. Add instant cozy appeal to the entryway with two or three charming wall decor pieces. 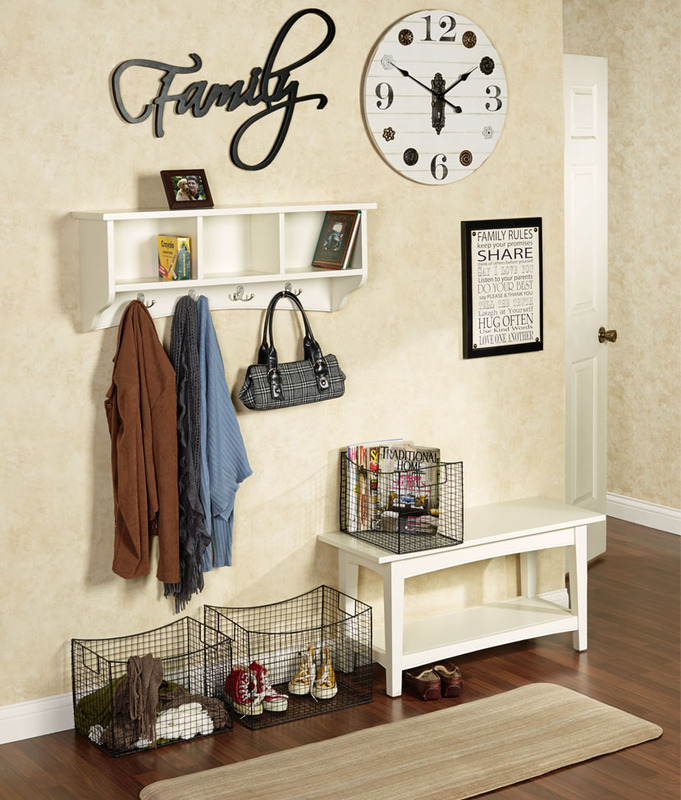 The Family Word Wall Art will remind you of what’s truly important. The Callister Wall Clock has a vintage quality coupled with a modern aesthetic for pleasing transitional decor. When you’re in a hurry, the Family Rules Wall Plaque will remind you to keep your cool and treat others with kindness. For the second entryway, we used darker pieces and woodgrain decor to create a rich, homey feel. The Jenson Double Wall Letter Holder serves double duty in entryway areas, collecting both your mail and jackets or scarves. 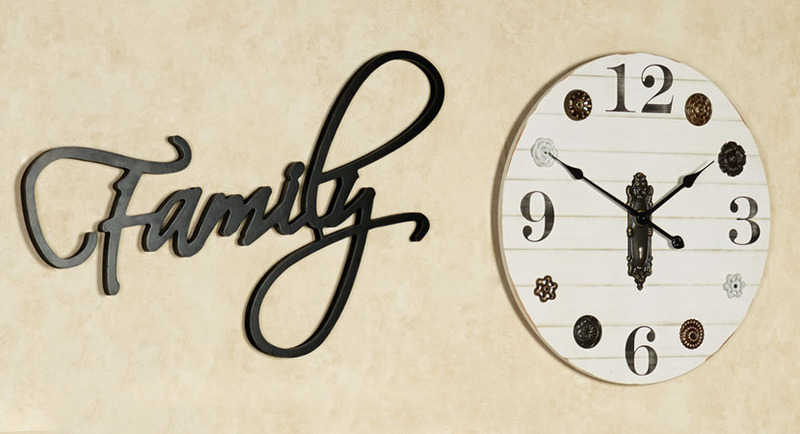 The Family Word Wall Art is easily visible against a light wall, celebrating your family ties in elegant fashion. Jot grocery notes or meeting reminders on the Wine Barrel Chalkboard, a piece that indicates your appreciation for fine wine.